Well a friend and I finally got the Oculus. Vladimir, would not it time now, to produce a mini update 0.9.7.1,5 ? I will not make any mini updates or mini patches. This is simply impossible, because I have to combine new code with old one. The first two pictures are really well done. I like the lava flows in it. The rest of them, I don't really like the way the lava flow changes the terrain (except the fire on ice one, this one look good). I don't exactly know why, but something is telling me that it is fake. The albedo difference tho is a very good addition. 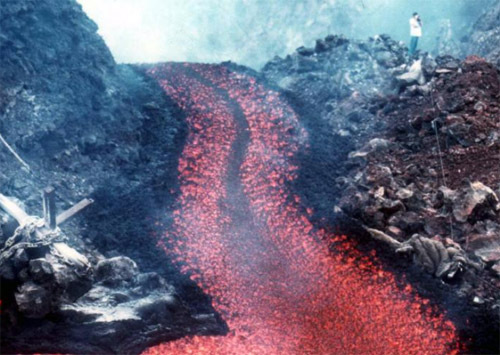 What is the generation cost of the lava flow? I assume it would have a big impact on it, right? Great job as usual. These kinds of SE updates always make my day. In the first pic the planet seems to be quite volcanically active. 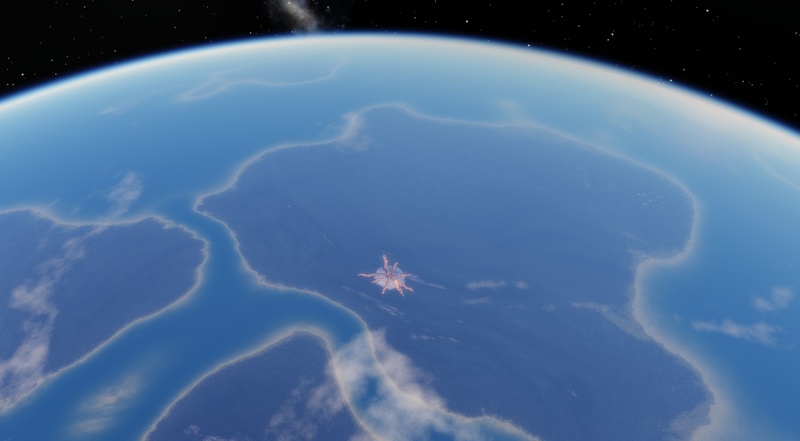 Maybe highly active worlds should have a denser atmosphere? 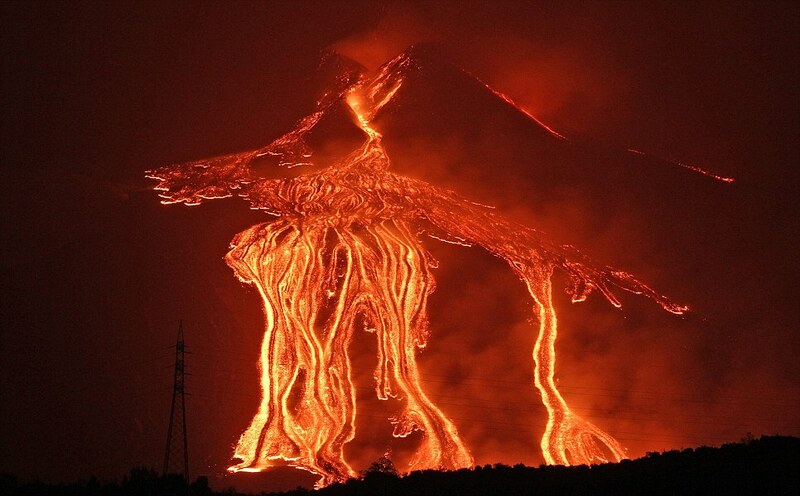 Also, how big of an effect would the lava in the seventh picture have on the surface of the planet in real life? The albedo features are very nice too. 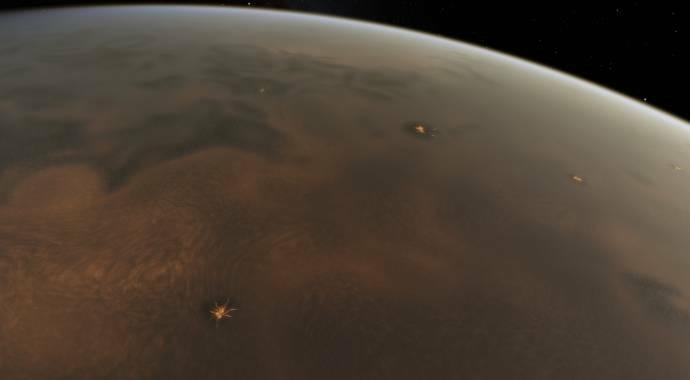 Maybe highly active worlds should have a denser atmosphere? The level of activity displayed there is no greater than on Io, which does not have any significant atmosphere. 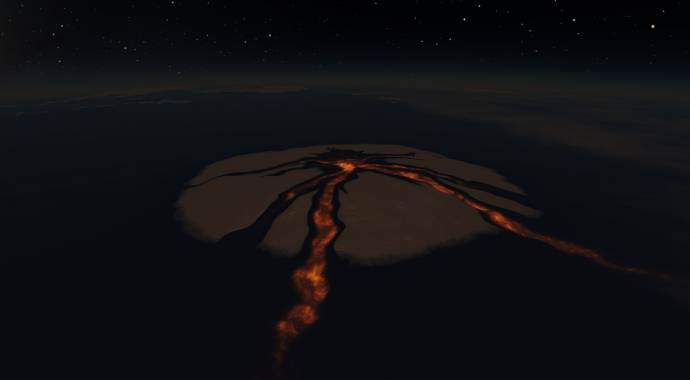 It would take volcanism on a far greater scale to beef up an atmosphere. I'm pretty sure he knows that. This is just WIP experiments after all. He did say "trying to make lava flows", not "made lava flows". I think, lava flows should make a bump on the ground, not a hole (a little bit like ice caps), except on ice, where it melts. I'm sure those lava flows will change a lot before the next version ships. Take a close look at the iceworld example, there's craters that overlap both lava and glacier with no change in crater's topography at all. Still, quite lovely. I'm so looking forward to this. I can easily tell that you currently are using hot rocks for lava. Thanks for the closer looks at the current version of lava! the terrain changes are actually realistic since freshly hardened lava especially basaltic lava does turn black after it cools and hardens! Hawaii's Mount Kilauea provides perfect examples of terrain changes caused by lava! for the ice planet with the volcano you have to make sure the whole planet or moon does not have a global ocean of liquid water beneath the global ice sheet since I do not think a volcano on the seafloor could grow perhaps several miles to reach the surface. volcanoes on Earth do erupt through glaciers and ice sheets here on Earth, take Antarctica for example or Iceland. regarding atmosphere density how dense the atmosphere is depends not only how volcanically active the planet or moon is but also how large it is since a super small moon or planet can not hold on to an atmosphere, and also the planet's distance from it's sun or suns since if a planet is too close to it sun it can blow it's atmosphere away into space. It will be pretty difficult in my opinion to get truly realistic looking lava flows if you are using just hot rocks without liquid lava. Good luck on the rest of development! and if you are working on seasonal changes for this update too I have some suggestions for those so let me know if you want me to tell them too you! Version 0.9.7.2 is going to be a giant leap foward. by the way, could you make some "before and after" screenshots for the albedo thing. I see something great here but maybe with the comparison it's more exciting. For the volcanoes: It looks so nice. And this work is remarkable because of the difficulty of the task. In the first image we can see sparsed volcanoes over the surface in a random way. This is possible in tidally heated objects like Io but in the general case they have to follow certain geographical distribution. The hot spots concentrate the volcanoes in certain regions (like the case of Tharsis basin on Mars) where the plumes of magma penetrate the crust, and with the rest of the planet without any volcanoes. In case of plate tectonics, the plumes hit different parts of the crust while moving so they perforate it in a strand of holes (like the case of Kuril Islands or Hawaii) that follow the trajectory of the plate. 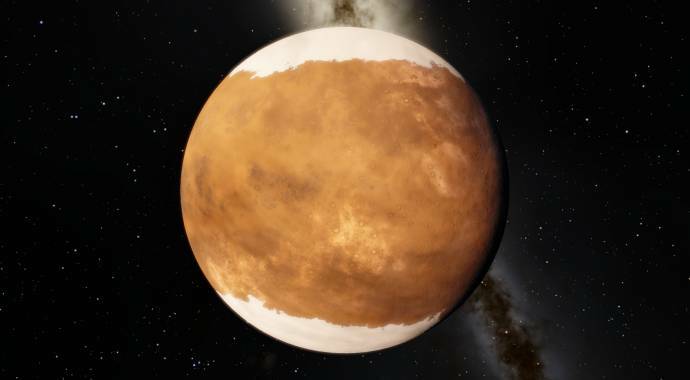 Considering those distributions of volcanoes (concentrated on regions on mars like planets, in lines on plate tectonic planets and randomly distributed on tidally heated moons) you could know more about every planet you visit and make it much more accurate in the global sense of perspective. I'm not a geologist but there are some things I can note. Olympus Mons on Mars is a shield volcano (like on your pictures) because of viscosity factors on the material the flows expand in large distances till they freeze. Meanwhile, on Earth it is common to have volcanoes with higher inclination. That diversity should also appear from planet to planet. I think they are great as you have done them but maybe it would be more realistic if in the more common case the channels became thinner (yours are more like streched lava lakes), and this has to be in relation to the slope (in the case of shield volcanoes this is a great aproximation but for more peak like volcanoes the lava rivers have to be quite narrow). Also it would be more realistic to make the channel paths more intrincate, with complex fractal patterns in some cases and ramifications like fingers. It's also important to note (as you have done in the seventh image) that the terrain sorrounding the channels has to be dark black like this and maybe considering the cooling of the flow in the farthest parts of the channels like a gradient to the dark terrain but with some scratches of shinning lava like this. 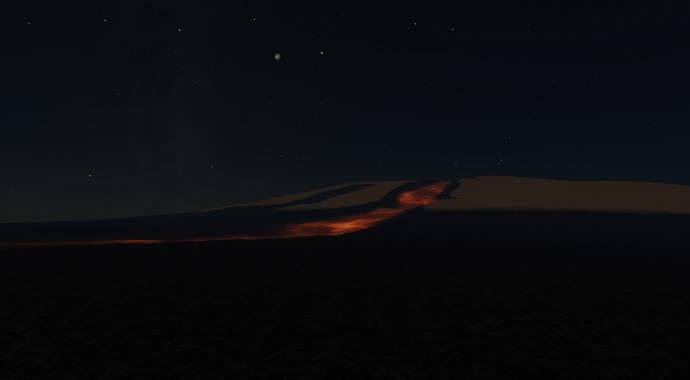 Also the region of the caldera has to be quite dark because lava can reach on eruptions many parts of the volcano without flowing to it only. And the aspect of the lava on those regions of the volcano can't just be like that. Near the caldera the lava has to be distributed more like fine hair as it is shown here or here. I think the glow and texture for the lava is very beautifull but I would add some colour variation. A more reddish lava is desirable, like on Earth. Also I don't know why, it looks like the central part of the lava flow is always cooler and darker as you can see on this images: 1 - 2 - 3 this gives a certain visual realism on the lava flows. I know, many things I'm putting here are not what your are working for in this moment but I think this would be interesting and easy to implement. Maybe it could be done on calderas or lava sources a bit of activity like expelling particles or making clouds. For the particles it would be a very simple animation. 20 or 30 red glowing points following a parabola living streams of tenuous light. The parameters of the parabola could change randomly for the next particles and some parameters would depend of some features like the planet gravity (bigger or smaller parabolas) depending on the range of initial speeds this ejectas are thrown. This has nothing to do with the dust cloud generated by the eruptions that I suppose you would implement to meke geysers on comets and for cryovolcanism and ash clods on Io for example. Too much questions and my very little bad performed explanations, I know. I don't want to be the usual scumbag that starts to speak of what has to be done when someone shows to him a serius work. Mantain us informed please. I enjoy every screenshot you put of the progress you make. And please someone (HarbingerDawn maybe?) add this things to the blog so we can transmit and share in a formal way all the work that has been done for the 0.9.7.2. That, I think, is because the edges of the flow are being perturbed by the terrain as they move, causing stirring of hotter material from the insulated core of the flow to churn out and recycling the "skin" of the flow regularly. 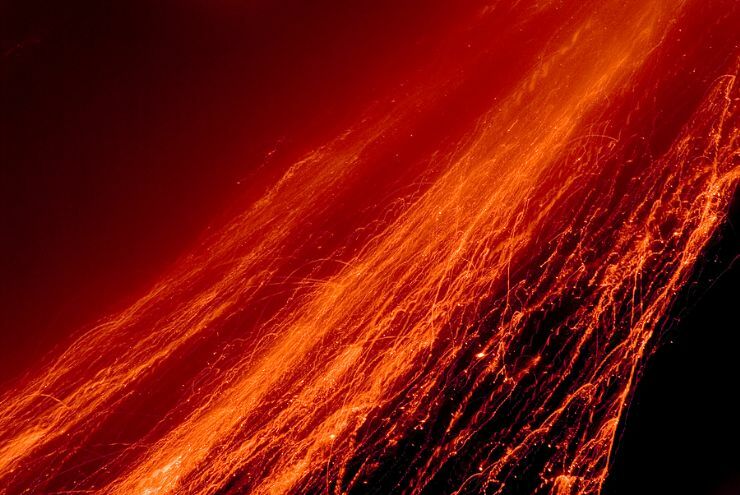 In the centre, the "skin" just sits on top and cools to a darker colour, carried along with relatively little resistance by the insulated magma below. 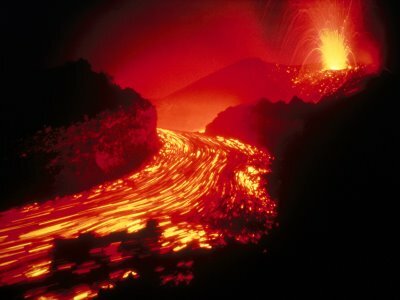 The centre skin only breaks when the flow of the insulated hot magma under it exceeds its constantly decreasing elasticity as it cools off in contact with the atmosphere. Since the resistance of the insulated core is pretty uniform, stress builds up at predictable distances, and you get the uniform breaks and folds in the skin in the centre that we can see in your linked images. 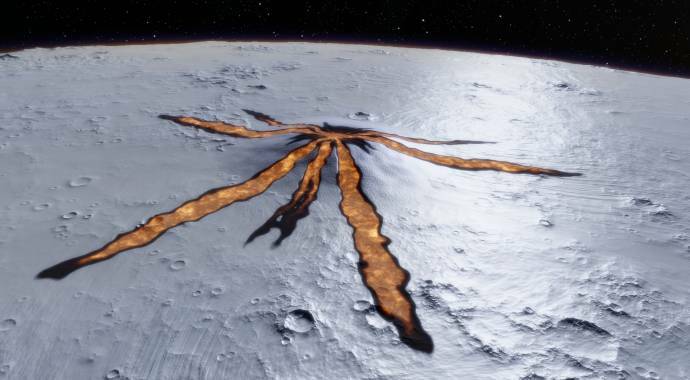 for the ice planet with the volcano you have to make sure the whole planet or moon does not have a global ocean of liquid water beneath the global ice sheet since I do not think a volcano on the seafloor could grow perhaps several miles to reach the surface. 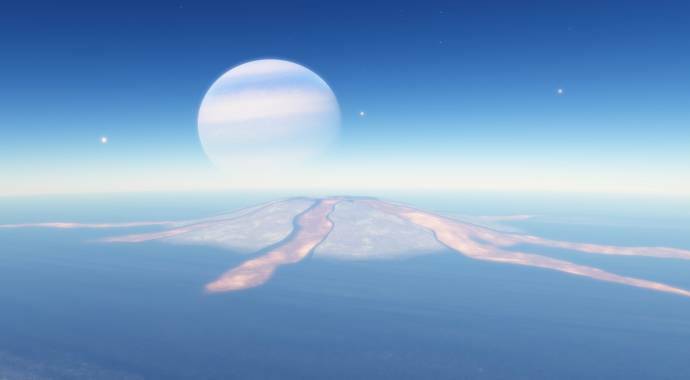 That was not an ice planet, but terra with ice cap. Like mount Sidely in Antarctica. SE don't model plate tectonics, so generation shaders have no this data. 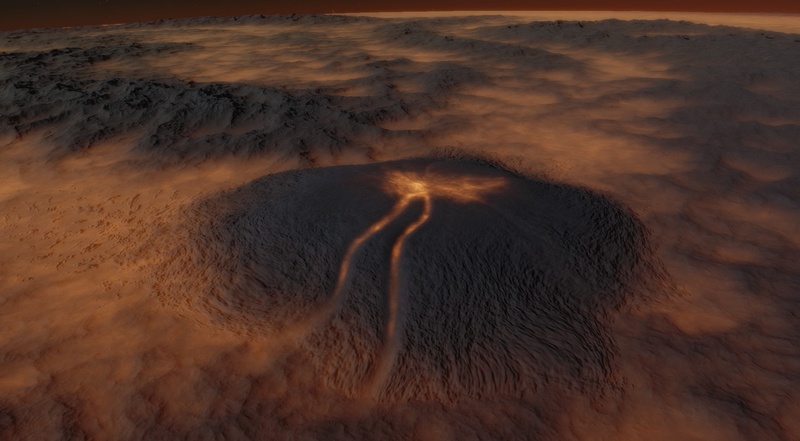 I may only model volcanic regions like on Mars. This is already done, but controlling the slope is impossible in current approach. Remember peaky mountains in 0.93? This is because I can't limit the slope, shader simply can't define it. Only post-process pass like erosion may make slope crumbled to 45°. You are asking to model rivers. You must know this is impossible task for pure procedural fractal generation. Only erosion post-process may model something river-looking (for steep slopes like volcano it actually must give nice results). Wait for SE 1.0 for this feature. In current approach it is impossible to make flows narrow, because narrow = short. I added a variable that controls this, so there might be volcanoes with narrow and short flows, up to only the lava lake in the caldera. Color of the lava is calculated in the rendering shader using the same texture that used for surface of stars, ie precomputed Plank spectrum texture. Generation shader just saved the temperature of the surface. So it is possible to alter the temperature in the rendering time (ie dynamic heating by the sun, that is already implemented). But achieving realistic looking brightness is tricky - red (cool) lava look too dark, if yellow (hot) look normal, and vice versa. Physically based rendering with HDR and physically based albedo, emission brightness and lighting value will solve this problem forever. This will not be implemented in 0.972. Particle system itself requires a lot of time to be developed. But the main problem is z-buffer. Currently SE don't have a single z-buffer for entire scene. I use many hacks to achieve real scales in space, like z-buffer splitting and removing empty space. This is because conventional 32 bit z-buffer have low precision (yes I know about logarithmic z-buffer and have implemented it, you may enable it in main.cfg and look at performance). Without single good precision z-buffer it is too hard to implement particles on planets, as long as 3D clouds, 3D water without z-fighting, clipping distance lower than 10 meters, right intersection of rings, aurora and comet tail with ships in orbit (remember this bug? ), and many other things. So firstly I have to rewrite the engine core to use reverse float z-buffer (I hope AMD finally added its support in their drivers!). And please someone (HarbingerDawn maybe?) add this things to the blog so we can transmit and share in a formal way all the work that has been done for the 0.9.7.2. It is too early for the blog. I will write the blogpost after I complete the lava/night textures (at some point). Will such a buffer will be able to give more precision for effects like black hole distorsion (like a complete distorsion for background galaxy and stars, no distortion for the foreground objects (like a ship or a planet you're in), and intermediate distortion for objects which have a comparable distance to camera asthe black hole) ? z buffer have no to do with black holes. They are rendered as post-process of the frame. The better way is render the scene into the cubemap and use it. But I have no proper formulas for distortion calculation.